by Antonia Wilmot-Smith, Anthony Yeates, Gunnar Hornig and David Pontin from the University of Dundee. In much of the solar corona magnetic forces are thought to dominate over all others. On large scales the evolution of the plasma is well-described by the equations of magnetohydrodynamics (MHD) and the magnetic field is thought to evolve through a sequence of equilibrium states in which the current and the magnetic field are parallel – i.e. with JxB≈0. These are known as force-free equilibria. Figure 1: A tangled configuration of post-flare loops (left) relaxes to a simpler configuration (right), as viewed by TRACE. The energy in the coronal magnetic field can be increased in many ways, e.g. by the emergence of new magnetic flux or by surface motions. This energy is released in solar flares and eruptions, after which the dynamics of the coronal plasma will act to return the system back to a force-free equilibrium. This process is called relaxation. There are two distinct cases, ideal and non-ideal relaxations, referring to relaxations without and with electrical resistivity, respectively. Here we consider the non-ideal situation. In a resistive evolution the topology of the magnetic field – the manner in which field lines link and connect – changes in time and the magnetic energy decays. There are various constraints on the evolution of the system which mean that the decay is, in general, not to the minimum energy state satisfying the same boundary conditions . The nature of constraints on the relaxation is critical but remains under debate. In his work on relaxation in a particular experimental device, the Reversed Field Pinch, J.B. Taylor considered the conservation total magnetic helicity as the only constraint on the energy minimisation . The total magnetic helicity measures the overall linkage of magnetic flux in the volume and is exactly conserved in an ideal evolution. The field resulting from such a relaxation is linear-force free* and the process is now known as Taylor Relaxation. What about the solar corona? Although the corona cannot globally be a linear force-free field, Taylor relaxation could apply in certain local domains. This idea has been explored in depth since the work of J. Heyvaerts and E.R. Priest . Some adaptations had to be made – for example, since field lines are anchored in the photosphere (rather than being closed) the total helicity is not well-defined and instead the relative helicity must be considered. This is the helicity relative to a reference field that satisfies the same boundary conditions. Evidence in favour of Taylor relaxation . . .
Taylor relaxation has been applied extensively in solar coronal modelling. A useful feature is that the energy difference between the initial and relaxed states is easily calculable and so simple estimates can be made on the ability of relaxation to heat the solar corona. In a series of studies P.K. Browning and co-workers (e.g. 3) have investigated magnetic relaxation in a class of kink-unstable loops. Here an efficient relaxation takes place with the development of a highly fragmented current system. The end state is linear-force free and in excellent agreement with the corresponding Taylor state. In terms of coronal heating, a recent model suggests repeated relaxations in such coronal loops would be more than enough to heat the corona . Many coronal relaxation processes do not follow the Taylor paradigm. For example, Bleybel et al. used vector magnetograms to analyse the coronal evolution following a CME in active region #7912, finding the relaxed state was not consistent with a linear force-free field. Figure 2: Magnetic field lines in a braided magnetic field (left) which undergoes a resistive relaxation. The final state (centre) is a non-linear force-free field. Contours of the force-free parameter α are shown on the lower boundary. A simple Taylor relaxation would predict a uniform field (right) with α=0 as the end state of relaxation. 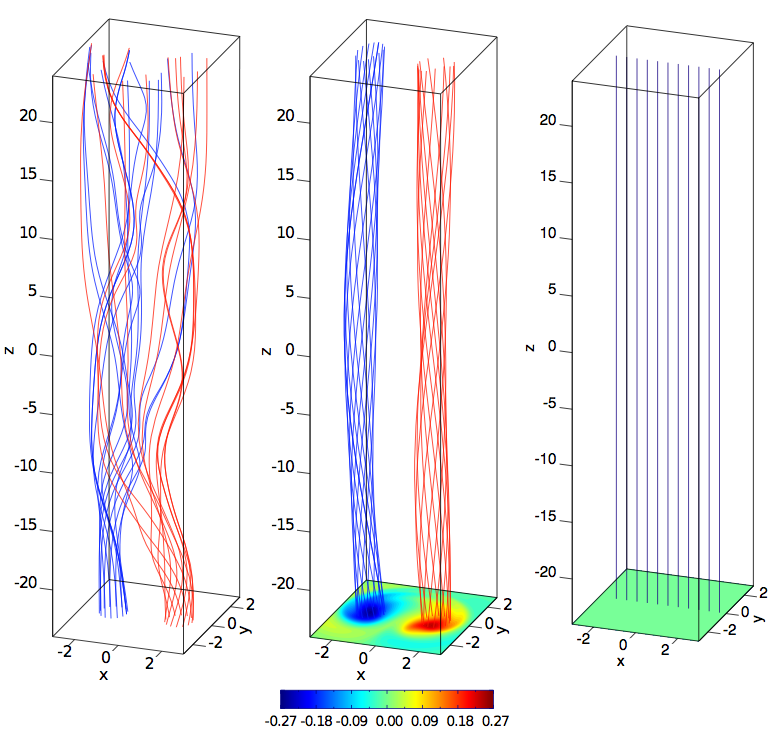 In an investigation into relaxation in a braided flux tube designed to model a coronal loop  the field is found to relax into two separate linear force-free flux tubes of different helicity sign, separated by a region of non-constant α (Figure 2). The picture is quite distinct to that of a simple Taylor relaxation which would predict a uniform vertical field in this case. Notice that here a coronal loop is straightened out to lie between two parallel plates which both represent the photosphere. Why does this difference arise? As expected, total helicity is well conserved in the evolution. Furthermore, current sheets are formed throughout the volume enabling reconnection, and so a full relaxation occurs. It seems that something more fundamental prevents the Taylor state from being reached – constraints beyond total helicity conservation must either limit the area of applicability or alter the final state. Some progress in this direction has recently been made. For the case of a magnetic flux tube with no magnetic null points in the volume (places where B=0) and an ideal evolution on the boundary, a quantity called the topological degree of the magnetic field appears to tell us when the Taylor state can’t be reached . The topological degree is a fundamental property of the field line mapping from one boundary to the other. To define it, we need to know the periodic orbits of this mapping. These are field lines, such as the red one in Figure 3, that link the same point on the bottom and top boundaries. Most field lines, like the blue one in Figure 3, do not have this special property. Periodic orbits are important because they are robust topological features that cannot be arbitrarily created or destroyed in a smooth time evolution of the magnetic field. In fact, a number called the index can be associated with each periodic orbit (it depends on the structure of the nearby field lines). The sum of the indices of all the periodic orbits is then the topological degree. Crucially, one can prove that for such a flux tube, the topological degree remains the same throughout a relaxation (the periodic orbits can only be annihilated – or created – in pairs of opposite index). Figure 3: Here the red field line is a periodic orbit, while the blue field line is not. For any particular magnetic field we can also calculate the topological degree of the corresponding Taylor state – that is, the linear force-free field with the same total helicity. If the two degrees differ then a relaxation cannot reach the Taylor (linear force-free) state. This provides a necessary condition for Taylor relaxation to be achieved. Of course even if the degrees of the two fields are the same we still don’t know whether a Taylor state will be reached because there could be additional, as yet unidentified, constraints. Magnetic fields in the solar corona can release significant amounts of energy when undergoing a resistive relaxation process but exactly how much depends on the end state of relaxation. The Taylor model of relaxation to a linear force-free field appears to hold in some cases but not in others. To get more precise estimates of heating rates we need to better understand the relaxation process. *The force-free condition JxB=0 is trivially satisfied for J=0; such fields are called potential. More general solutions have non-zero current and satisfy curl B=αB where the force-free parameter α is constant along field lines. If α is uniform in space then we have a linear force-free field while if α varies from field line to field line then the field is non-linear. Heyvaerts, J., Priest, E.R., Astronomy and Astrophysics, 137 63 (1984). Browning, P.K., Gerrard, C., Hood, A.W., Kevis, R., Van der Linden, R., Astronomy and Astrophysics, 485, 837 (2008). Bleybel, A., Amari, T., van Driel-Gesztelyi, L., Leka, K.D., Astonomy and Astrophysics, 395, 685 (2002). Yeates, A.R., Hornig, G., Wilmot-Smith, A.L., Physical Review Letters, in press (2010) arXiv:1007.4925.